You’ve heard of comfort food right? This morning I told Chris I didn’t feel well and I needed comfort knitting. It’s that knitting that isn’t frivolous and isn’t fancy. It just makes you feel good. And usually it’s fast. I think this is part of why people knit dish clothes (although I’ve never done it myself) and garter stitch scarves. Several years ago for our bike trip I’d knit a hat for myself from handspun yarn I’d bought from That’ll Do Betty at the Walnut Valley Guitar Festival. 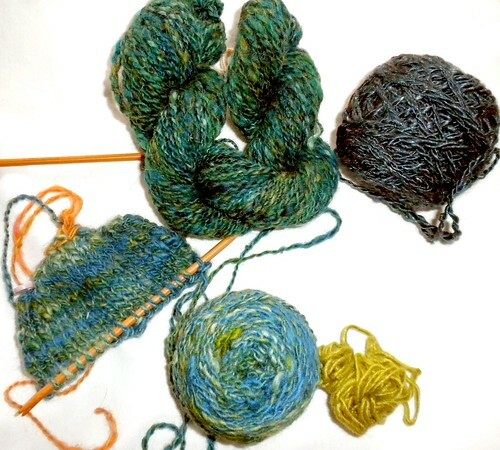 Betty always has a great selection of handspun. For the hat I’d used most of the three little skiens I’d bought so this year I added another to my collection in a deeper green (top center – but destined for cuffs) because I had mittens on the mind. I’m using the Fitten’ Mitten technique from Jean Shrouder whom I took a class from at the 2009 SWAK Knit Out. Jean is an amazing knitter and a great teacher. You walk out of a workshop with her and know you have just received lessons that can be applied to your knitting through your life. I’ve already knit one pair of Fitten’ Mittens for Chris (he’s wearing them now or I’d get a photo!) and know I’ll be knitting many more using Jean’s pattern.